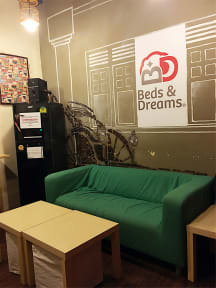 If what you’re looking for is a conveniently located hostel in Singapore, look no further than Beds and Dreams Hostel formerly known as Rucksack inn @ Temple Street. Occupying 2 floors as a backpackers’ hostel which is located in the heart of Chinatown that offers easy access to the Train station and main bus services that will bring you to most of city’s must-see destinations. This hostel is furnished with oriental-inspired rooms decorated and named to reflect Singapore’s Chinese heritage, designed to allow guests to step into the history of Singapore’s Chinese immigrants. We are equipped with the latest widescreen iMac’s which will definitely suit your surfing needs. This outlet is suitable for groups of up to 90 guests. All our rooms are fully air-conditioned, fan, international plug socket, comprise of fresh linens, blanket and soft pillow. We also provide complimentary Wi-Fi access throughout the Inn. A simple breakfast of coffee, tea and toast is provided at no charge. With its perfect location right in the heart of Chinatown, you get easy access to the train station and main bus services that take you around the city. You will get to experience the Chinese culture with sumptuous local dishes surrounding you. We are also just a short walk from Clarke Quay, where you will find a vast array of bars, restaurants and relaxing River Tours.